I came around the curve, and stopped, inhaling sharply. My legs were accustomed to keeping the rapid pace they had mastered over many years in New York City, and with the abrupt halt, my feet slid on the gravely path—the sound rattling the quiet afternoon. I held that bit of air preciously for a moment as though the entire mountain might vanish if I let go. The words ‘Vivir es encreible’ escaped with my whispering exhale. To live is incredible. Instead of staring at the brick wall outside an office window in Manhattan, I was gazing at a mountain-perched abbey on a gorgeous fall day in Spain. I was five weeks into an adventure that would last eight months and take me to 10 countries. And in that moment I understood for the first time since I left that I had created a new reality. I was 25 when I moved to New York. At the time, I suffered from a rabid craving for endless motion and opportunity. To keep moving was to be alive, and I imagined NY to be full of never-ending possibilities to aspire and achieve, to hunger and feast, to learn and love. I wanted to immerse myself in the city’s frenzy, to own part of it but also to be lost in it, to be anonymous any time I fancied. The city was a remedy. I thrived in New York for a long time, deftly managing the various components of my life in the churning metropolis for more than 15 years through more than one reinvention. And then, one morning, I surfaced from the crowded, begrudging subway into the packed frenetic humanity of Union Square. A young woman flew through the crush, zig-zag run-walking like a weird high velocity robot. I laughed as I turned to avoid colliding and thought, “This is so absurd.” Then I almost cried. Because I knew it meant the city had changed for me, and I could no longer pretend I still loved it. Around that same time, I realized also that I could no longer scratch the persistent itch of my life-long wanderlust through vacations squeezed in on annual leave. I wanted to travel without obligations, expectations or commitments. And when all things were examined and considered, it seemed like such a simple desire to fulfill: to set myself free to explore the world on my own terms, without a return date or a place even to call home. 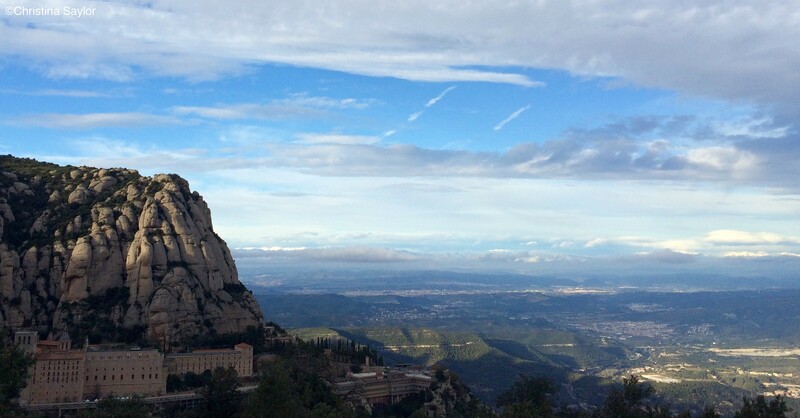 So, a year later, there I was on a Spanish mountainside awed by the beauty of Montserrat, embracing my new reality and delighting in the fact that I had set out on such an adventure. I was also hungry and my feet hurt… If I had just cracked the Lonely Planet or surfed a few internet waves before I boarded the train out of Barcelona, I might have known that Montserrat hosted a network of hiking trails leading to a variety of ancient monk retreats. And I might have learned the Abbey’s café would be closed due to the national holiday. But I didn’t. So, I was wearing my city boots and traveling uncharacteristically light on snacks. Fortunately, I had just enough coins to score a packet of vending-machine breadsticks, and eventually I found the funicular that takes visitors up the mountain. Even in my city boots I could handle the wide path down which led me to that spectacular view. And that is how travel goes. Sometimes you’re hungry and your feet hurt. But the view is always interesting, even when it’s not breathtaking. This travelogue is a collection of experiences from the 8-month journey following my New York exodus. The galleries hold collections of my favorite photos from various destinations. And the blog hosts a variety of posts, from excerpts that I logged on the road to longer posts and essays as I look back on my experiences. I’ll be posting regularly. Great stuff Chris. Keep posting in Facebook on updated blog entries for Sayloraway. Looking forward to more entries. Thanks Curt! I’ll definitely share new posts on Facebook!